Whether you’re a venture capitalist, private investor or institutional investor, AusBiotech welcomes you to attend the AusAg & Foodtech Summit 2018. The Summit will connect you with a diverse range of investible companies operating in the agritech and foodtech sector, including SMEs, startups and researchers on the verge of commercialisation. AusBiotech is pleased to offer qualified investors free entry to the AusAg & Foodtech Summit. For more information, please contact the Events Team on events@ausbiotech.org / 03 9828 1400. The agritech and foodtech industry strives to enhance seeds and crops, improve diet and provide functional foods for preventative health. It has a pivotal role to play in sustaining our future populations, with agricultural technologists and food science researchers striving to develop tools that will sustain the world’s projected population of 9.7 billion in 2050. 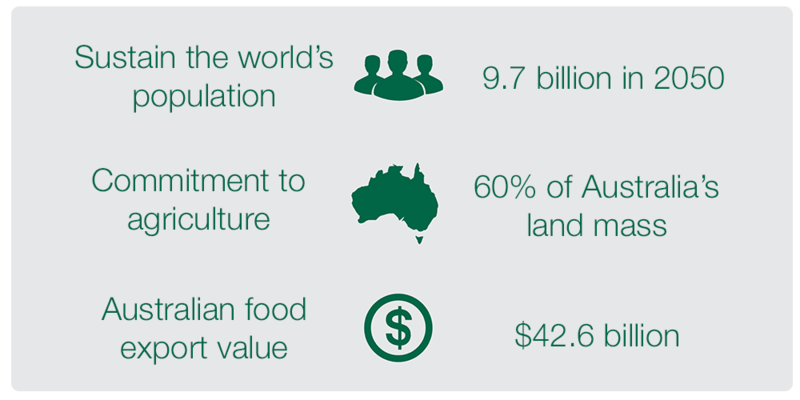 Agritech and foodtech makes an enormous contribution to Australia’s economy and food availability, with around 60 per cent of Australia’s land mass is committed to agriculture (ABCA 2014). Austrade estimates that the total value of the Australian farm and fisheries food production was A$42.6 billion, with Australian food exports valued at A$30.6 billion (2011-2012).